Capgemini study finds retailers will need to cover their costs with increased automation, white glove services. In the race to provide ever-faster last-mile delivery service to customers without breaking the bank, most retailers face a thorny challenge—consumers don't want to pay for it, according to a survey from Capgemini. Nowhere is that dichotomy more stark than in grocery delivery, a sector that has catapulted from fringe benefit to table stakes in just 18 months, Capgemini Vice President Shannon Warner said in a breakfast session at the National Retail Federation's NRF Big Show conference in New York today. 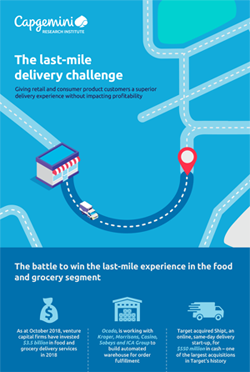 "The Last-Mile Delivery Challenge: Giving retail and consumer product customers a superior delivery experience without impacting profitability," study surveyed over 2,870 consumers in addition to 500 supply chain executives, entrepreneurs, and industry leaders. Consumer demand for fast grocery delivery is hot—55 percent of customers say offering two-hour deliveries would increase their loyalty—but it is not being met by stores, of which only 19 percent currently provide that service. While many of those stores have launched grocery delivery initiatives, they are stuck in slow motion, with 59 percent of firms offering delivery time frame of more than three days. The survey showed that consumers have noticed that imbalance, and they are not happy. The driving factors of "delivery dissatisfaction" include: high prices (59 percent), non-availability of same day delivery (47 percent), and late deliveries (45 percent), the Capgemini survey showed. That split between consumers' high demands for services and their low willingness to pay for them have retailers on the ropes. Organizations are currently charging customers only 80 percent of the overall delivery cost, and that number won't be changing anytime soon, since only one percent of customers are willing to absorb the total cost incurred for last mile deliveries, the survey showed. That finding was backed up by another consumer survey released today, as an NRF study found that 75 percent of consumers surveyed expect delivery to be free even on orders under $50, up from 68 percent a year ago. The solution to this dilemma may lie in retailers finding "nontraditional" ways of charging for last-mile delivery, Warner said. Instead of expecting to provide delivery service at a profit, firms could provide it at cost or even at a loss, and make higher profits elsewhere, she said. Citing a classic example, she said many grocers sell Thanksgiving turkeys at a loss because they know that most holiday shoppers fill large baskets of items with higher margin items, she said. Applied on a bigger scale, grocery retailers could build profits by applying subscription models, material handling automation, process engineering, and white glove services, Capgemini found. One example of this strategy can be found in the British grocery chain Waitrose, which charges premium fees for "While you're away" food delivery made through keyless entry to consumers' homes, and through "Wine tasting at home" delivery provided by trained sommeliers who offer educational services as well as simple delivery, according to Capgemini. We Want to Hear From You! We invite you to share your thoughts and opinions about this article by sending an e-mail to ?Subject=Letter to the Editor: Quarter : Survey: consumers demand same-day delivery, but don't want to pay for it">	. We will publish selected readers' comments in future issues of CSCMP's Supply Chain Quarterly. Correspondence may be edited for clarity or for length.